Children ask a lot of questions. That's what children do. Consequently, childhood is the best time to teach young people about the world. 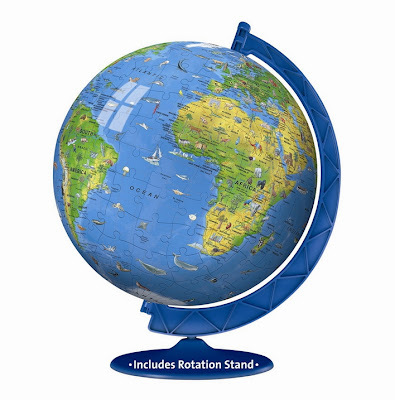 And what better teaching aid is there about the world than a world globe? Their ball-like shape and beautiful colors make them a fun way of teaching geography. However many, if not most, children get to see globes only at school. The bulkiness of educational globes is a factor against them being at many homes – especially for families that move around a lot. But there are now children's globes that double as a fun toy. If they are treated as toys with educational and sentimental value, children's globes would more likely survive a move. But, whether you are a teacher or a parent, take the time to teach children about the world through globes. You'll be amazed at the variety of lessons you can teach by using a globe as starting point. For example, you can teach your children what part of the world their extended family came from or where friends of various nationalities have moved from. While the information you get with globes is mainly current (and can be updated), children might ask you questions the answers to which are not found in globes. For example, questions like "who invented world globes?" Here's a quick answer. Understandably, since there were still many lands the Greeks didn't know (but just hypothesized) about, this globe is a far cry from our modern globes but you can already discern Europe, Greece and the British Islands. By all means, start your kids early on globes. Let globes become a way of teaching children valuable lessons through stories. Break the cycle of geographic illiteracy in children. Or else, someone else might teach geography to them – and not in a good way.